Prime Number – Positive integer number (greater than 1) that can not be created by multiplying any other 2 Positive integer numbers. 2 is only “even” prime number. Rest all primes are odd numbers. Composite Number – Opposite of prime. Positive integer number that can be created by multiplying other 2 Positive integer numbers. 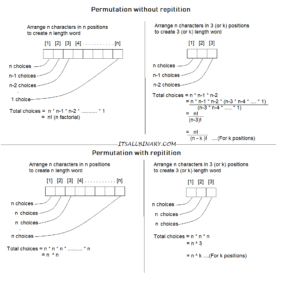 Permutations – Permutation is arranging the members of a set into an order. Different order of same elements is different permutation. Ex: Seating arrangement of John, Tim, Jay –> 1) John 2) Tim 3) Jay is different than 1) Tim 2) Jay 3) John. Order of seat numbers matter here. 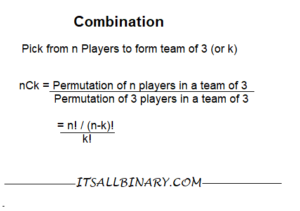 Combination – Combination is a selection of items from a set, such that the order of selection does not matter. Different order of same element is not different. Ex: Forming team of 2 from John, Tim, jay –> Team of John & Jay is same as Team of Jay & John. Order has no sense here. Probability = Number of wanted outcomes / Total number of possible outcome. 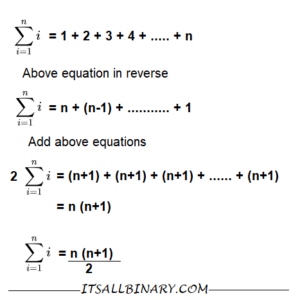 Logarithm – Logarithm is reverse operation of exponentiation. Greatest common divisor (GCD) – GCD of two numbers is the largest positive integer that divides both the numbers. Fibonacci sequence – Sequence of numbers starting frmo 0 & 1 such that each next number is the sum of the two preceding numbers. 0 , 1 , 1 , 2 , 3 , 5 , 8 , 13 , 21 …..